The glove project FingerMarks took place in Pècs (Hungary) in 2010. Pècs has glove factories since 1762. For a week the designers and artists Silvia B., Chequita Nahar, Jackie Habets, Alexander Fielden, Hester van Eeghen, Merijn Bolink, Rozemarijn Lucassen en Ela Bauer worked with the glove craftmasters in different glove factories. Everybody learned a lot from each other and they were all surprised by the interesting results. The week ended with a Pecha Kucha evening. Concept; Elizabeth de Vaal, Jackie Habets en Karin van Paassen. Click here to see a clip from the workshop in the glove factory. The four days’ Dutch/Turkish fashion manifestation Bridges to Fashion took place in 2008/2009 in the Historisch Museum Rotterdam and in many other unexpected places, such as an old railway platform. Bridges to Fashion showed collections, designed by a large group of Turkish and Dutch designers, ranging from streetwear to haute couture with exhibitions, shows, movies, performances, talkshows, a symposium, parties and a designerstore. Designers like Monique van Heist, Marga Weimans, Claes Iversen, Iris van Herpen, Bas Kosters, Edwin Oudshoorn, Arzu Kaprol, Bahar Korçan, Sibel Aygün and many others, showed their collections. 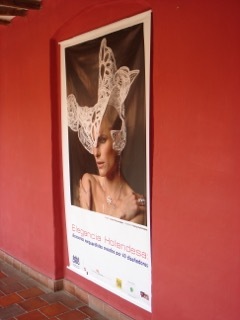 In 2006 and 2007 the exhibition Elegancia Holandesa has been shown in Bolivia, Argentinia and Brasil. The work of 40 Dutch designers was shown in the exhibition: hats, shoes, gloves, jewellery, shawls, stockings, bags and autonomous work. In Bolivia hat designer Bart Konter gave a well-attended hat workshop. The exposition attracted a lot of attention from media, like live television, articles in newspapers, etc. The project was an initiative of Mirta Demare (Stichting Essential Arts) and Karin van Paassen.